Don’t call this a zombie book, because it’s not. 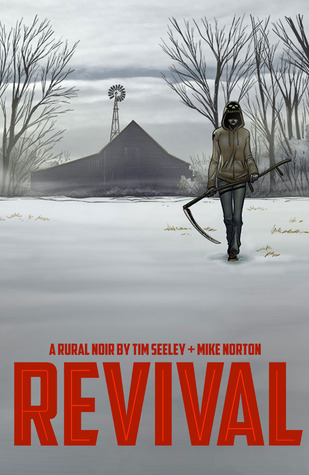 In Revival, a relatively small number of recently deceased people in a small Wisconsin town inexplicably return to life. They can now recover from virtually any injury, and range from remaining exactly the same as when they lived in the conventional sense to, well, odd. Right off the bat, Tim Seeley introduces us to several characters, each with a distinct personality and role to play. Officer Dana Cypress appears to be the main character from that bunch, but her college sister, her sheriff father, a snow mobile riding punk exorcist, a CDC biologist, and an eccentric old man all demand our attention. Furthermore there’s a cub reporter who broke the story as well as a celebrity who, at first glance, appears to be based off of Nancy Grace. That’s a lot of characters in such a short collection, but Seeley paces them excellently and, more importantly, inserts their stories organically. The revived themselves are a creepy bunch, and some are obviously dangerous as they tear the throats out of their loved ones. Other are virtually comatose, and still others function as though nothing has happened. Seeley reveals just enough to keep us reading, to garner our interest, but he also opens up several mysteries that demand our continued readership. He walks that fine line of giving us important information while also teasing certain plot threads. Mike Norton’s art is crisp, understated, and laid out very well with smooth sequencing. I also appreciated the angles he chose to employ in several of his panels. There’s nothing outlandish, but he’s just unusual enough to keep the eye stimulated. I think it would be a tragedy to neglect the colorist, Mark Englert. This is a dark story with flashes of the grotesque as well as little moments of morbid humor. His colors are tame and work well with the story, but they are still interesting and enhance Norton’s art. Considering that there is snow in virtually every outdoor picture, I believe his talent is to be commended. To be honest, I picked this book up at the library because Amazon kept recommending it to me and I thought I’d give it a try. I truly didn’t think I’d like it as I’m a little burnt out on anything related to zombies, yet the original storytelling, interesting characters, and hints at future plot threads absolutely made me a fan. I can’t wait to read more … especially because of that white demon wandering the woods. I have no idea where that one is going. This entry was posted in Book Reviews and tagged Book Reviews, comic books, fiction, Graphic Novel Reviews, graphic novels, image comics, mike norton, revival, tim seeley.